We are delighted to announce the date of this year's Summer Drinks Party, Wednesday 30 July 2014. This event will not only give you an opportunity to network and raise money for our affiliated charity, The Eve Appeal, but we are also honoured to announce that Sharon Conheady, Director at First Defence Information and FWN Steering Committee Member, will be joining us for a sneak preview of her new book entitled "Social Engineering in IT Security" which is being launched at the Blackhat convention in the US in August 2014. Sharon is a director at First Defence Information Security in the UK where she specializes in social engineering. 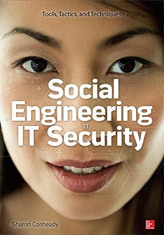 She has presented on the topic at security conferences worldwide and regularly leads training seminars on how to perform ethical social engineering tests and defend against social engineers. You may recall Sharon speaking at the FWN Annual Event on this topic in March 2013. This year's FWN Summer Drinks Party will be held at Corney & Barrow Fleet Place, 3 Fleet Place, London EC4M 7RD from 18:00hrs. Places are limited, so be sure to book early! A mere cost of £10.00 (£5.00 of which goes to our affiliated Charity, The Eve Appeal) will provide you with a cocktail on arrival, canapés and wine/beer. (Non-members £15.00). So, don't delay, email us now to reserve your place info@fraudwomensnetwork.com Payment of £10.00 (£15.00 non-members) can be made on the night at the venue. We look forward to seeing you on 30 July 2014 at our Summer Drinks Party and to celebrate the launch of Sharon's book! !